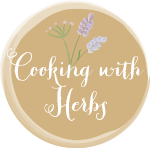 Notes from Ladysmock Cottage: Herb Meatballs in Tomato Sauce. Herb Meatballs in Tomato Sauce. For a quick tomato sauce soften a chopped clove of garlic or two and a finely chopped onion in a sauce pan. Add a tin of chopped tomatoes a tea spoon of sugar, half a finely chopped small red chilli and a small dash of good vinegar. Let it cook down on a low heat for an hour or so to thicken - this also gets rid of the tinny taste to the tomatoes. Add a good handful of chopped basil and cook on. For the meatballs place your minced beef in a bowl and season well with salt and pepper add chopped herbs and lots of them - I used savory, rosemary, thyme, parsley and a little mint. Comibine well to mix the herbs into the meat and roll out small balls on a floured surface. Cook the meatballs in oil until lightly coloured all over and then add a good helping of the tomato sauce and cook through in the sauce. Serve with spaghetti or linguine and parmesan cheese. Thanks Karen, again another great and seasonal choice of herb for July. Chicken in Tarragon and Mushroom Sauce. Tarte Tatin with Blackberry Syrup.